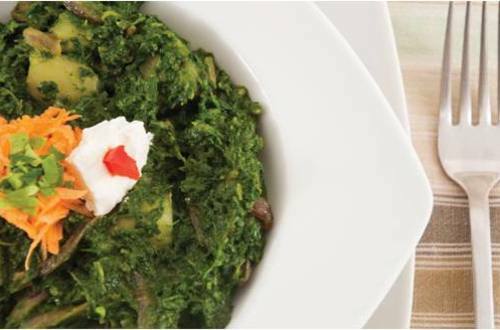 Potatoes and spinach simmered with one of our most versatile mixes makes for a simple and quick recipe. 2 Heat oil in a pan over medium heat. Add cumin seeds and allow it to splutter. 3 Add chopped onion and sauté till it turns translucent. 4 Turn down heat to low flame and add ginger-garlic paste. 5 Add chilli powder, turmeric powder, Knorr Chef’s Royal Vegetable masala, salt and green chillies. 6 Add chopped tomatoes, spinach leaves and sauté well for 3 minutes. 7 Add diced potatoes and cooked for 10 minutes with stirring in between every 2 mins. 8 Pour one and a half glass of water (250 ml). 9 Cook till vegetables are done. 10 Garnish with chopped coriander leaves. Healthy soup like carrot soup can be taken cold or hot depending upon the liking. This is an easy recipe for making Mixed Vegetable curry which is mild and has less masala. You can serve it as a side-dish with Dal Makhani. This corn & pasta salad is so easy to cook when you have Knorr easy to cook Italian pasta red sauce. Fresh American corn lends a sweeter taste to the salad & tomato adds the tangy flavour.